A slender line of shimmering stones adorns this V-shaped PANDORA Rose ring, bringing glamour to its contemporary design. Wear this wishbone piece alone or stack it with similar styles in contrasting textures. Take your style one step further by also wearing it as a midi ring. Comes in sizes 44 to 64 for all your styling needs. Available online or in-store. PANDORA Rose Shimmering Wish Ring is rated 4.7 out of 5 by 26. Rated 5 out of 5 by Danime from Beautifully simple and elegant Absolutely love this ring! Delicate yet trendy. My only complaint would be the point of the ring is very sharp so be careful! 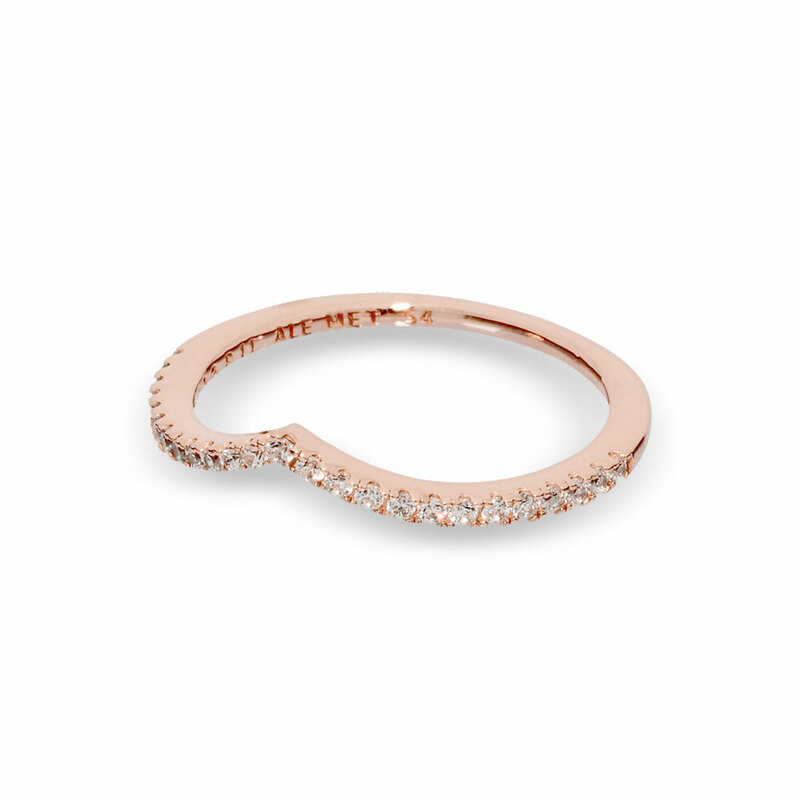 I paired it with another rose gold stack ring which looks wonderful and also helps with shielding pointy part of ring. Rated 5 out of 5 by Carolguill from Beautiful! My mother in law gave me this ring for Christmas and I absolutely LOVE IT! It shines so pretty and rose gold is stunning! Rated 3 out of 5 by Nephie77 from Cute and Simple, but Lost a Stone on Day 1 I love rose gold, and thinner bands look good on my fingers. The shape is great, however, on the first day I wore it, one of the stones fell off. Right smack in the middle of the ring, on the point. Very disappointed. Rated 5 out of 5 by pepischerer from Love my ring! I absolutely LOVE this ring! I bought it the day before yesterday and I have been in love with it! I love how it matches with my charm bracelet! Rated 2 out of 5 by Viviann from Faulty This ring is so beautiful and I love it so much, however, I had to have it exchanged twice because each time one of the crystals would fall out !